Keiran McAlpine stabbed George Courts outside a shop in Lochgelly, minutes after being involved in an altercation with him. A fight had broken out and after coming off worse, McAlpine went to his home nearby. He returned accompanied by a 16-year-old youth and brutally stabbed Mr Courts, leaving him fighting for his life. McAlpine, 20, was seen beckoning his 23-year-old victim to a part of the street which was not covered by CCTV before stabbing him, the wound piercing his abdomen and liver. The stabbing was witnessed by Kieran Foy and Reece Tweedie, friends of Mr Court. They helped the injured man into Mr Tweedie’s car and rushed him to the Victoria Hospital in Kirkcaldy. Mr Tweedie drove at top speed while Mr Foy held a tee-shirt against his friend’s wound to stem the blood flow. They had to stop on the way to allow the victim to be sick and then they carried him into the accident and emergency department on reaching the hospital. Sheriff Charles MacNair praised the actions of Mr Foy, 22, from Cowdenbeath, and Mr Tweedie, 22, from Lochgelly. As Mr Courts received surgery, McAlpine went back home to put his clothes and the knife into his washing machine. After a four-day trial at Dunfermline Sheriff Court, a jury unanimously found McAlpine guilty of three charges. On April 30 last year at Knockhill Close, Lochgelly, he assaulted George Courts by striking him with a knife . On the same day at Francis Street, Knockhill Close and elsewhere he was in possession of a knife in a public place. 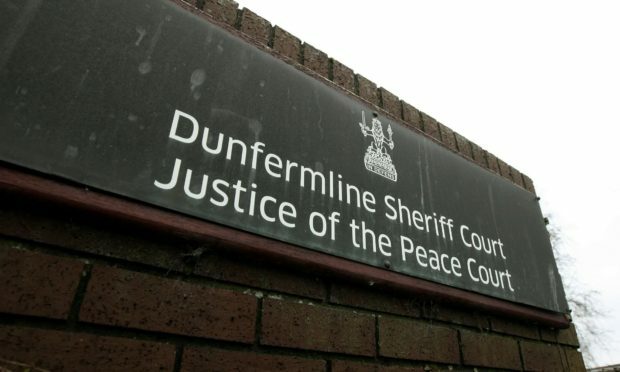 He was also convicted of putting his clothes and the knife in the washing machine at his then home in Francis Street, Lochgelly, in an attempt to pervert the course of justice. During the trial, McAlpine, who moved to Dysart since the incident, blamed the stabbing on the youth was with him. The youth, now 17, answered “no comment” to all questions put to him in the witness box. Sheriff MacNair called for reports and McAlpine was remanded in custody until sentencing on May 16. Mr Courts, a painter and decorator, from Ballingry, has since made a full recovery. His girlfriend had been pregnant at the time of the stabbing and gave birth to their second child last summer.